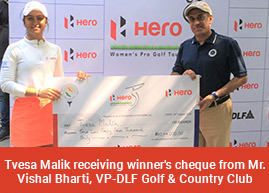 Gurgaon, March 22: Neha Tripathi played one of the finest ever rounds in Indian women’s golf as she shot a scintillating 10-under 62 to open up a 11-shot lead after 36 holes in the sixth leg of the Hero Women’s Pro Golf Tour at the Classic Golf and Country Club on Thursday. Neha, 26, who has been a long time pro since 2009, was flawless as she closed both the front and back nines with stunning eagles. She also carded six other birdies, three each on either side of the course. The Kolkata golfer, still searching for her first win this season, began the day with a one-shot lead and had two pars on first two holes. Despite birdies on third and sixth, there was no indication that a historic round was in the making. Then she exploded around the turn as she birdied eighth, eagled ninth and birdied 10th and 11th to be five under through the four holes from eighth to 11th. At that she stage was seven-under with seven holes to go and the way she was playing, even a historic sub-60 looked possible. She parred 12th and 13th and another birdie followed on 14th. At 8-under she still had a chance, but she failed to find birdies on the next three holes. She reached the green in two on 18th and holed her eagle putt to get to double figues under par for the first time in the history of the Hero Women’s Pro Golf Tour. What made the round even more stunning was that she had no bogeys and she seemed in total control on every hole. Neha’s solo show left everyone playing for the second place, as she opened up a 11-shot lead going into the final round. Tvesa Malik, who opened the second day with an eagle 2 on the first, dropped a bogey on ninth and parred the rest of the 16 holes in her 71 that put her Tied-2ndalongside Amandeep Drall (72). Amandeep was three-under through first four holes and at that stage she had drawn level with playing partner Neha, who herself was two-under through four. However, her birdies dried up after that and she had just one double and one bogey in her 72. Gaurika Bishnoi (72) was sole fourth at 1-under 143, amateur Ridhima Dilawari (71-73) was fifth and another amateur Sifat Sagoo (72-74) was sixth. Smriti Mehra (75-72) was seventh, Vani Kapoor (74-74) trailed in eighth while Mehar Atwal (74-75) and Trisha Sunil (73-76) were tied for ninth. Gursimar Badwal, the Hero order of Merit leader was trailing in 12th place with rounds of 74 and 78. In the final round, Priya Puri and Hita Prakash in a two-ball will start the day’s action, followed by Komal Chaudhary, Tavleen Batra and Sonam Chugh. Siddhi Kapoor, Millie Saroha and Suchitra Ramesh are in Group 3, followed by amateur Tanirika Singh, Afshan Fatima and Ayesha Kapur in Group 4. Group 5 will see Gursimar Badwal, Khushi Khanijau and Trisha Sunil playing together, while Group 6 will feature Mehar Atwal, Vani Kapoor and Smriti Mehra. The second last group of the day has amateurs Sifat Sagoo and Ridhima Dilawari with Gaurika Bishnoi. The lead group sees Amandeep Drall, Tvesa Malik and Neha Tripathi.